Last Tuesday I flew out to New York City, USA to give a talk at the Quantopian NYC Meetup and moderate a panel on "Programming Wars" at the Trading Show New York 2016. Both events were extremely interesting and I met a lot of great people. I want to write a brief summary of the trip as it brought to my attention some fascinating areas of quant finance research that I was not previously aware of. 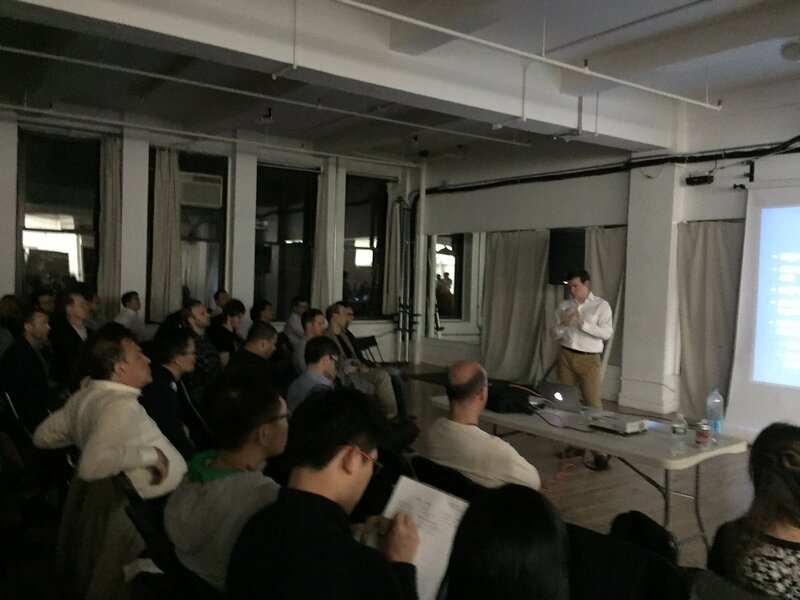 The Quantopian NYC Meetup is a regular event organised by members of Quantopian in order to engage with the algo developer and quant finance community of New York. Two talks were presented at the event. The first was given by Seong Boii on the topic of "Data Driven Strategies". Seong talked about "Horizontal" and "Vertical" business disruption and how these concepts can be applied to quant trading strategy development. In particular, vertical disruption occurs when businesses attempt to refine a business model and make it incrementally better, such as with Coca-Cola or Pepsi trying to come up with a better cola drink. This is analogous to quants attempting to create a better trend-following or mean-reversion model. Horizontal disruption occurs when businesses attempt to enter new markets that aren't usually part of their core specialty. This would be the case if Coca-Cola decided to begin making a lot more food-based products, for instance. Horizontal disruption for quants usually involves looking at alternative strategies or datasets when attempting to hunt for alpha. Seong then applied both of these disruption ideas to the well-known Post Earnings Announcement Drift strategy. In particular Seong coded up the algorithm using two datasets - namely the Zacks Analyst Earnings Surprises and News Sentiment by Accern. Seong clearly outlined how using orthogonal datasets that are underutilised by the majority of the quant community he was able to generate alpha, with a Sharpe of 1.36 over the period tested. The second talk was given by myself on The Quest for Profitability: Optimizing Your Quant Research Workflow To Help Find New Trading Strategies. I wanted to highlight how retail quants spend a lot of time searching for new alpha via alternative data sources and academic research, but could gain new alpha through optimising their research workflow to be more akin to that of a professional quant. The introductory part of the talk asked why we even carry out quant trading in the first place. I mentioned that it is usually a combination of academic interest, personal income or managing external capital. I then outlined that the major goal of quant trading research is the hunt for new sources of uncorrelated returns, known as "alpha". I showed that alpha decays very rapidly in the modern, hyper-connected world. In the latter half of the slides I talked about common retail quant workflows and why they were suboptimal. I then discussed the seven stages of a professional quant workflow, including Investment Thesis, Data Acquisition & Cleansing, Universe Definition, Alpha/Strategy Development, Model Ensembling, Portfolio Construction & Risk Management and Execution. I highlighted how this type of workflow can help with strategy development and finding new sources of alpha. I also had a great chat with many NY quants after the talk, where we discussed machine learning (principally the limitations of using Gaussian distributions for ML models! ), the Capital Asset Pricing Model and how to get started in quant finance. Thanks to everyone who asked questions - they were very insightful! I'd like to thank Kelly Elmstrom and Seong Boii for kindly inviting me to the talk - I had a great time meeting everyone! The following day I travelled to Tribeca (aka the "TRIangle BElow CAnal street") to attend the all-day Trading Show New York 2016 from Terrapinn. The conference was a mixture of lectures, panel discussions, roundtable events and networking breakouts, all on the topics of quant finance, automated trading, big data and high-performance computing (HPC). A notable highlight of the conference included a great discussion by Manoj Narang of Mana Partners LLC, where he talked about the fusion of discretionary and quantitative approaches, whereby "humans are great at reasoning from small datasets". Another absolutely fascinating talk was given by Marcos Lopez De Prado, a Senior Managing Director of Guggenheim Partners as well as Research Fellow at Lawrence Berkeley National Laboratory. He spoke about the emerging field of quantum computing and how it is poised to revolutionise quant trading. You can find out more at the website Quantum For Quants. I hope to personally write a bit more about quantum computing on QuantStart as I also feel it is going to have a huge impact on HPC/quant finance in the near future. I was invited to the show to moderate a panel on "Programming Wars", whereby myself, Ilya Kipnis, Gaurav Chakravorty, Sri Krishnamurthy and Stefan Karpinski discussed the pros and cons of Python, R, C++ and Julia for quant research and algo implementation. Many issues were discussed including hiring, community size, documentation, latency as well as data science and "data wrangling". I also met many of the individuals who were at the Quantopian NYC meetup the evening before at the event. Yet again, we all had some great discussion on machine learning, coding, containers (Docker etc), algo performance and how to get started in quant finance. Overall the trip to NYC was absolutely fantastic. I met some great people and found some extremely interesting avenues of quant finance research to pursue and ultimately discuss on the site. I'm very much looking forward to QuantCon Singapore in a months time and it will be great to meet those of you who are able to attend. Join the Quantcademy membership portal that caters to the rapidly-growing retail quant trader community and learn how to increase your strategy profitability. How to find new trading strategy ideas and objectively assess them for your portfolio using a custom-built backtesting engine in Python. How to implement advanced trading strategies using time series analysis, machine learning and Bayesian statistics with R and Python. ©2012-2019 QuarkGluon Ltd. All rights reserved.